For most children going back to school and their parents, the new school year starts the week before or the week following the Labor Day holiday. As such, now is a good time to remind motorists of the importance of obeying school zone traffic signs, such as speed limit and school zone warning signs. Unfortunately, fourteen percent of all traffic fatalities in the past year were pedestrians, according to a recent report by the National Highway Traffic Safety Administration (NHTSA). Children are particularly vulnerable because they are more difficult for drivers to see. Moreover, young children can get caught up playing and run into the road to chase after a ball while not fully appreciating how dangerous this is. Important school-related signage, such as school zone speed limit signs remind motorists to drive slowly and be on the lookout for children at play. Many school districts choose to increase student safety by employing a crossing guard equipped with paddle or handheld stop signs. Crossing guards with proper hand held stop signs and related gear such as orange reflective vests can help ensure that children are able to safely cross the street at the appropriate intersections. All drivers on the road are required by law to heed crossing guards. About: STOPSignsAndMore.com manufactures standardized and customizable school property signs at its California-based facility. 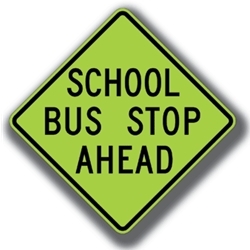 School districts across the country order its long-lasting, easy-to-read school zone related signage to improve the safety and well being of students, parents, and staff. Discounts are given for most bulk orders.